In “Proof ” (based on the 2001 Pulitzer Prize-winning David Auburn play ), Gwyneth Paltrow plays a woman mourning the death of her father (Anthony Hopkins), a brilliant, yet mentally unbalanced mathematician who may have passed both his brilliance and his madness onto his daughter. Now, pay attention class, as we do a little cinematic algebra and calculate the partial number of movies that use math as a major plot element. Okay, it’s not algebra, it’s just simple addition (or is it fractions?). Ahh, math was never our strong suit. It’s the tale of a narcissistic yuppie Charlie Babbitt (Tom Cruise) who discovers how to be a caring person during a cross country trek with his autistic savant brother, Raymond, or “Rain Man,” as Charlie called him when he was a tyke. While having few social skills, Ray is capable of doing incredible calculations in a split second and retains enough statistical data to make you never want to fly again (except on Qantas). “Rain Man” has aged into a ripe piece of ‘80s cheese, one of those films that makes you say, “No, really? Best Picture Oscar?” Definitely, definitely. But more so, Raymond has become one of the most iconic characters in film history. Comedians mimic him, sitcoms parody the film and no doubt Hoffman is sick of people shouting “I’m a very good driver” at him on the street. Peter Greenaway’s “Drowning by Numbers” is a fractured fairy tale about three generations of Cissie Colpitts, each of whom drowns her no-good husband and convinces the local coroner to help them cover up the murder. What makes this a math flick is the appearance of the numbers one through one hundred, placed throughout the movie, in order, either visually or spoken by characters. It’s kind of like looking for Al Hirschfeld ’s “Ninas” or a movie version of “Where’s Waldo?” (which we’re surprised was never made... was Jim Carrey busy?). The visual game can be distracting if you’re aware of it the first time you see the movie (although it’s hard to miss), so it’s better to play on second viewing. The third entrant in the “Die Hard ” franchise teams John McClane (Bruce Willis) with Harlem shopkeeper Zeus Carver (Samuel L. Jackson) in a battle of wits and will against Simon Gruber (Jeremy Irons), the brother of the dead villain from the first film. Simon sends the cops, as well as John and Zeus on a series of wild goose chases around Manhattan (while he loots the federal reserve downtown), some of which include tricky math problems that, if answered improperly, will set off bombs in public places. Imagine having that kind of pressure while taking your SAT test! Will Hunting (Matt Damon) is a tough guy MIT janitor from the south side of Boston who sublimates his genius to fit in with his pallies. But when he can’t resist the urge to solve a seemingly impossible calculus problem posted in the hallway, his gift is discovered and his life is turned upside down. Will finds himself struggling with inner demons, jealous mentors, demanding women, snobby frat boys, rivals in the ‘hood and most of all, Robin Williams at his über-sensitive fuzzy-wuzziest. Will’s genius is not limited to math, and the scene where he mops the floor sociologically with an arrogant student is this Gus Van Sant weepie’s highlight. In Darren Aronofsky’s black and white thriller, Sean Gullette plays mathematician Max Cohen, who is obsessed with finding numerical patterns in everything, right down to swirling cream in coffee. His drive to conquer chaos theory starts as a plot to crack the stock market, but leads to a questioning of the very fabric of our reality, bringing Max to the brink of madness. He also has apparently divined the true name of God, a 216 digit number that’s going to make praying far more time consuming. All of this gives Max some wicked migraines, but it’s nothing a good power drill can’t fix. “Pi” is part psychological drama, part science fiction, part art house flick, a rare film that actually demands participation from the viewer. There really aren’t too many movies about socially well adjusted mathematicians. But the award for most troubled geek goes to John Nash (Russell Crowe) in Ron Howard’s “A Beautiful Mind.” Based on a true story (but given the Hollywood gloss), the movie tells of how the schizophrenic Nash believed a fantasy that he was doing secret code breaking for the government during the Cold War while confiding in a best friend who didn’t exist. 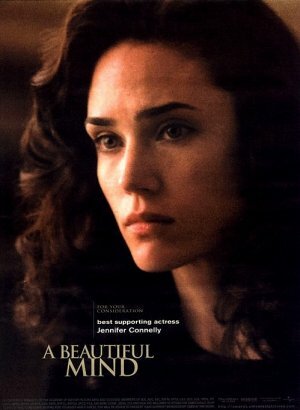 And yet it’s NOT a fantasy that he manages to score the most beautiful bride on Earth, played by our favorite, Jennifer Connelly! Okay, so technically, this isn’t a MATH film, since quantum physics is more of a SCIENCE, but since “quantum” translates as “how many,” we’re gonna stretch. Mostly because this 2004 mind bender would make an excellent double feature with “Pi,” but only if you have plenty of Excedrin on hand. Combining drama, sci-fi and documentary, “What the (Bleep) Do We (K)now! ?” stars Marlee Matlin as a jaded photographer who, after experiencing a number of incredible events, is forced to consider the possibility that there’s more to reality than what we can perceive through our senses. Interspersed interviews with mathematicians and scientists attempt to put forth an empirical basis for the self-help idea that we create our own destiny... at a neurological level! Whether you agree or disagree with the theories in this film, any movie that forces the audience to think can’t be all bad. 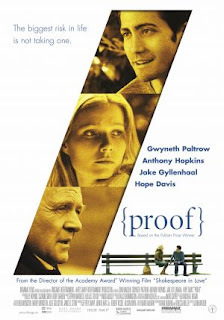 Will “Proof” inspire young filmgoers to enter the challenging world of Number Theory or Probability and Statistics as a career? Or will it just make heads hurt? Will Gwyneth add another Oscar nomination to her resumé? And can Anthony Hopkins ever make people forget about fava beans and a nice Chianti? Calculate the odds and combine the results into a theorem that will prove that people will always misspell or incorrectly pronounce co-star Jake Gyllenhaal’s name. Show your work. Man, we’re glad we’re not in school anymore!